"There are multiple underlying causes for dog skin sores including parasites (fleas, mites), poor grooming, dog skin infection (bacterial pyoderma, fungal), endocrine diseases, skin or hair follicle disorders disorders such as seborrhea, medication side effects (from corticosteroids) and allergy. It is rare for a sore or lesion to appear without another underlying condition such as allergy. In this case allergy would be the real trigger or cause. To help with the diagnosis, the table below details canine sores by body location, including lesions found on the paws, legs, ears and face. Treatment involves addressing any symptoms such as itch, the use of antibiotics for infections and identification and removal of any underlying cause. Homeopathic products can provide added support." There are many possible causes for dog skin sores. The treatment depends on the type and cause of the sore. Anytime your dog has a sore that doesn’t go away in a few days or that oozes yellow or green-colored puss, see your vet. 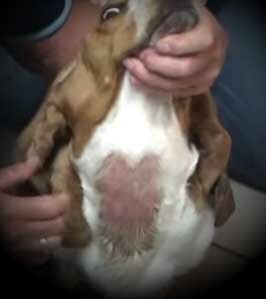 Acute Moist Dermatitis or "Hot Spots"
Video review of the causes and treatment of a dog hot spot sore on the back. 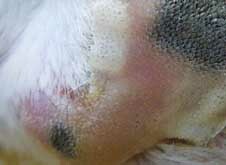 These types of dog skin sores are caused by self trauma, allergic reaction, fleas, grasses, pollens or even an insect bite. Treatment starts by cleaning any sores on the dog with soap and water. Then apply an antibiotic ointment and cortisone ointment. If the condition worsens see a veterinarian to learn more about the condition. Hot spots are round, raw lesions that occur most often on the head, hips, and sides of the chest. Hot spots are most common on dogs with long, dense hair, and usually occur during hot weather. Hair usually falls out in these areas. The skin becomes very irritated and dogs will often lick and bite at the area. Hot spots can be caused by a number of things, including flea bites, mites, poor grooming, and allergies. Treatment depends on the cause. Clipping the hair around the lesions makes it easier to clean and treat the dog skin sores. If they are infected, oral antibiotics will be prescribed. Treatment will be prescribed for fleas or other parasites, and your vet can instruct you on proper grooming techniques. 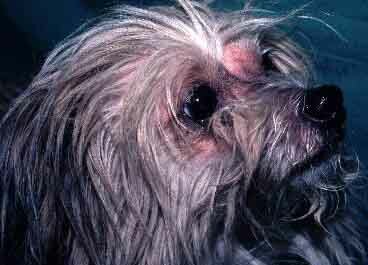 Canine pyoderma refers to any dog skin sore or lesion that is pus-producing. It is the second most common cause of skin disease in dogs. The condition can involve a single occurrence or a problem that reoccurs. There are many causes with the condition classified by on the type of bacteria, the chance that there is some type of underlying problem, disease prognosis (projected outcome) and if the infection will respond to available therapies. The infection might exist only on the skin surface or in more chronic cases, infection can result in dog skin sores that reach into the fatty tissue just below the skin. Most cases are only on the skin surface and can be easily treated with an antibiotic selected to address the specific bacteria identified. Antibiotics are usually prescribed for 3 weeks for surface skin infections and 6 weeks for deeper infections. Certain breeds such as Standard Poodles, Vizslas, Akitas and Samoyeds suffer from deep pyoderma or infection as a result of the condition sebaceous adenitis. Deep infections can also be helped by antibacterial benzoyl peroxide shampoo. The shampoo works by decreasing bacteria on the skin surface and by reducing the likelihood that an infection will return. Shampoos are used 2x per week. All dogs suffering from skin infection will need to be re-evaluated for progress. There are two types of mange, demodectic and sarcoptic. 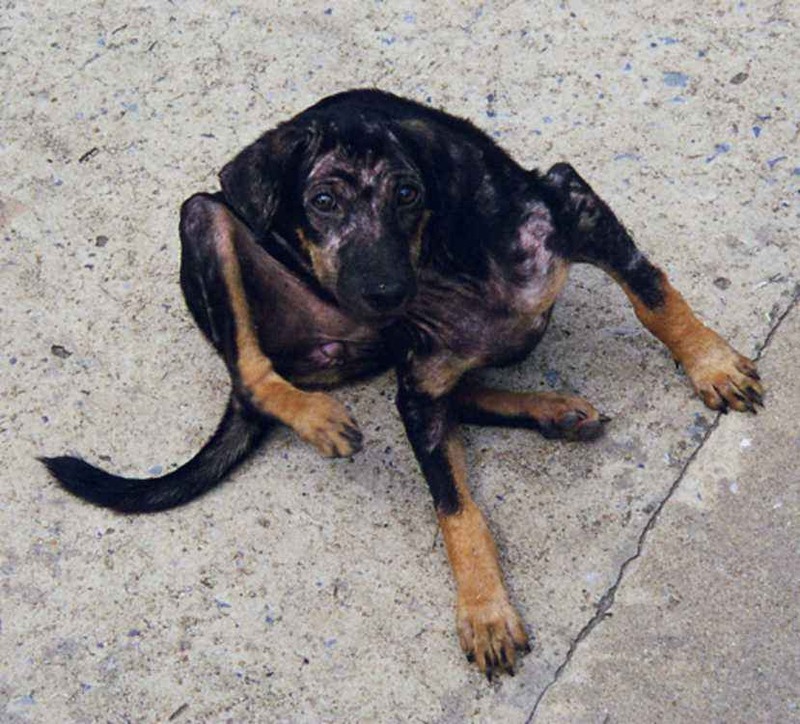 Demodectic dog mange is usually seen in puppies from mites that spread to the puppy from the mother. The demodex canis (demodectic mange) causes both localized (specific areas) and generalized symptoms (all over the body). If a puppy have a small number of mites, no treatment is usually necessary as the condition will clear by itself. If there are moderate numbers of mites, then dog sores on legs and other areas could appear. It is possible that dogs with mange have a compromised immune system that was unable to fight off the parasites. In adults, dog sores are commonly seen on the face, legs, abdomen and hind legs. 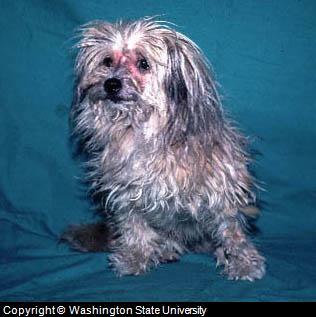 Sarcoptic dog mange is from mites that spread from dog to dog or dog to wild animal contact. 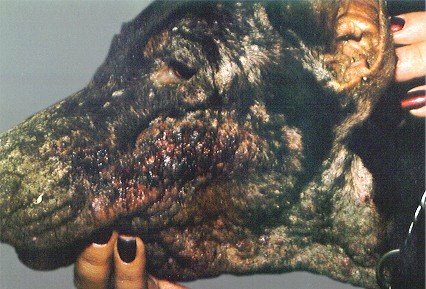 Mange dog skin sores ooze and crust over along with hair loss and itch. This may occur in one small area or may occur all over the body. To diagnose demodectic and sarcoptic mange, your vet will do a scraping of the affected skin and examine it under a microscope. Mites are not always found when a small number are causing the condition. In this case, the Vet will initiate treatment, and confirm the diagnosis if your dog responds to treatment. If your dog has this condition, it is usually treated with an over the counter topical lime-sulfur dip such as Naturasil for Pet Mange. If the skin area is infected your veterinarian might prescribe a prescription medication. 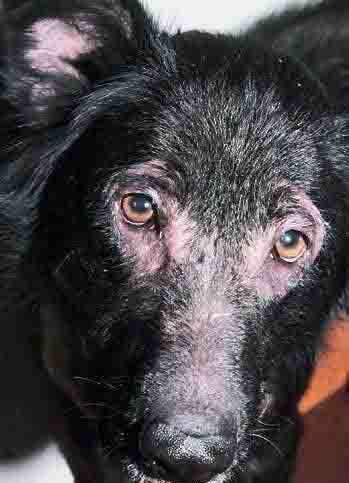 Since mange is difficult to diagnose, sometimes its better just to start treatment and see if there is some improvement. 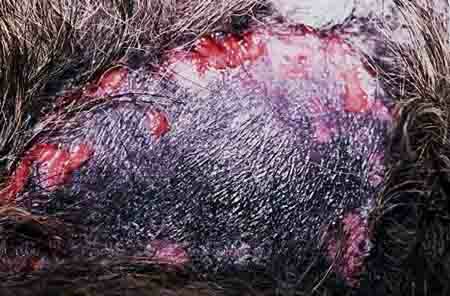 Blastomycosis is a fungal infection that causes dog skin sores. It is a systemic infection that causes respiratory problems, a reluctance to walk, generalized weakness, a poor appetite, and even blindness. One of the first signs of the illness, however, is round, oozing sores on the skin. The sores may later crust over. This condition usually occurs in the fall and is caused by breathing in spores that are released when your dog digs into the ground. The fungus occurs most often in areas near river valleys or lakes. Blastomycosis in dogs can spread to multiple parts of your dog's body through the blood stream. To diagnosis Blastomycosis, your vet will examine secretions from the sores under a microscope. Blastomycosis is treated with oral anti-fungal medication such as itraconazole (Sporanox) for a period of 6 months and with an anti-fungal medicated shampoo such as Curaseb. The condition cannot be passed from dog to human or human to human. Picture of Dog with Blastomycosis which caused on a red sore on the dog nose. Histoplasmosis is a less common fungal infection. Like blastomycosis, it is a systemic infection that causes weight loss, cough, fever and diarrhea. It can also cause dog skin sores. It is diagnosed and treated the same way as blastomycosis. Flea allergy dermatitis, environmental and food allergies can lead to dog skin sores. Even if you don't find any fleas on your dog, they are skilled at hiding, with even a few able to cause a problem in allergic dogs. Symptoms are usually in the form of raised red bumps known as hives. They are itchy and will cause your dog to scratch. Excessive scratching may break the skin, leading to infection. If no infection occurs, hives will usually go away on their own once exposure to the allergen is removed. If infection develops, however, medical treatment will be needed. See your vet if your dog has sores that don’t go away in a few days, or sores that ooze anything yellowish in color. He may need antibiotics. Fungal infection that causes skin lesions and ulceration. Can be accompanied by digestive system and breathing problems. Diagnosed with a biopsy. Can cause dog nose ulcers. Also found on the ears Caused by a blood cell parasite. Considered to require Euthanasia. Cancer in dogs that can cause ulcers along with itching and redness. Diagnosed via a biopsy. Treated with surgical removal and possibly radiation or chemotherapy. Tumor found on the skin of older dogs. Appears like a dark colored nodule. Diagnosed with a skin biopsy. Treated with surgical removal. Panniculitis is usually caused by a skin injury or when a foreign body enters the skin. It can also have an autoimmune or unknown cause. Nodules form on the skin surface that can become ulcerated. A veterinarian will drain the lesion and remove surgically if necessary. Condition caused by the fungal contamination of a wound. It is found in a single ulcer, nodule or sores on dog legs. Treated with surgical removal. Pyoderma is a bacterial skin infection. It can result in ulcerated skin pustules or nodules. The condition is diagnosed with a biopsy, culture or skin scraping. Treatment is with antibiotics. Pythiosis is a condition where aquatic mold causes skin sores on a dogs legs. It can also occur on the tail base. Related symptoms are digestive problems and itch. The condition is diagnosed with a biopsy and examination under a microscope of any drainage. It can be fatal to the dog. These tumors form into nodules which can become skin ulcers. Diagnosis is with a biopsy. Treatment involves surgical removal or by leaving the lesion in place depending on the location, discomfort of the dog and if the tumor if malignant. Spider bites contain toxin that can cause skin swelling that can become ulcers. Diagnosis is with a biopsy. Treatment includes the use of Corticosteroids. A dog may paw at affected areas causing additional skin sores and damage. Sore on Dog Back Caused by a Squamous Cell Carcinoma (SCC), a condition related to sun exposure on the back. Causes crusted ulcers to form on dog legs or the body. Diagnosis is with a biopsy. Treatment for these types of canine skin lesions involves surgical removal. 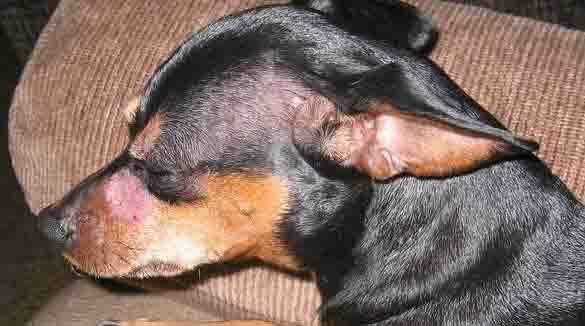 Sore on Dog Nose Picture Caused by Solar Dermatitis, a condition caused by sunlight injuring skin cells. It usually happens on the top of the nose. Like most canine diseases, there are multiple causes for dog skin sores on different areas of the body as outlined in the table below. Dog sores on Legs Canine Osteosarcoma: An osteosarcoma occurs in giant breeds that are middle age to seniors including Rottweilers and Scottish Deerhounds. The condition causes lesions on the front dog legs 75% of the time. The condition starts in the medullary bone cavity and breaks through the bone, ultimately causing a skin lesion. It is common for osteosarcoma to form at sites where bone fractures have been repaired with metal implants. Diagnosis is made with a biopsy. Fortunately only 10% of dogs diagnosed have cancer cells that spread from the original site. After diagnosis, a veterinarian will determine if the dog is in pain and if the pet can maintain a good quality of life after amputation. He or she might test the dog with a sling on one leg to simulate the experience of having 3 legs. Survival time after amputation with no other treatment has a median survival of 135 days with 11.5% surviving 1 year, and 2% for 2 years. When chemotherapy is used along with amputation, survival times jump to 200 to 400 days, with 1 year survival at 30% to 40%. Two year survival jumps to 20%. Typical treatment is the use of cisplatin for 3 to 4 weeks after amputation. Demodicosis (Demodectic Pododermatitis): mange mites that cause localized lesions on the paws. IT is common in young dogs (under age 1) and rarely seen in older dogs. The disease is frequently seen with bacterial infection on the paws. Paw areas see hair loss. Parasites do not affect claws and footpads. Sores on Dog Paws Caused by Demodectic pododermatitis in a male terrier. 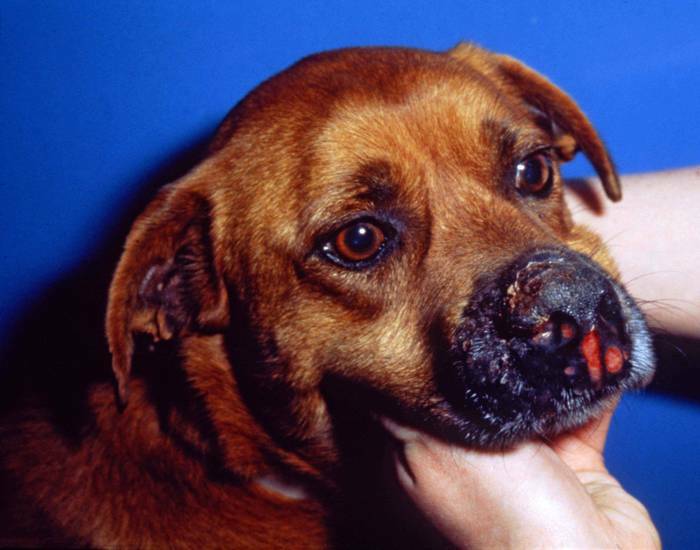 Digital Hyperkeratosis: This dog skin disorder affects the nose and footpads. Breeds susceptible to this problem include English bulldogs, Basset hounds, Beagles English springer spaniels and Cocker spaniels. The condition is caused by debris with collects on the footpads. Areas that bear weight cause the keratin to wear off. It is usually seen in older or middle-aged dogs. Other symptoms include leathery skin, oozing from the skin and crusting. Diagnosis is based on the condition being limited to the paws and the absence of the condition in other skin areas. The condition can be improved by improving the dog's hydration and the use of topicals that help with seborrhea. Atopy: Paws that come in contact with allergens in the environment such as pollen. Diet: Food reactions can result in an allergic response on the paws as well as contact allergies. Pemphigus Foliaceous (PF): A dog skin autoimmune disease in which the canine immune system directs its efforts against the patient itself. Occurs in approximately .6 to 1.4% of all dogs. The disease causes skin bumps or pustules to suddenly appear on the paws. The lesion ruptures, causing crusts to form over the skin lesions on dogs. Other symptoms can include lameness, pain and appetite loss. 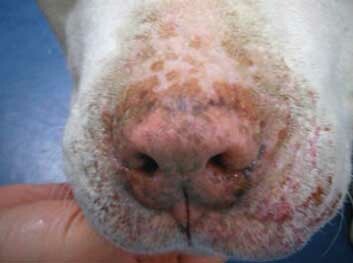 Treatment depends on the type of canine pemphigus diagnosed. Topicals are used for Pemphigus erythematous. Prednisone and other therapies are available for other types. Superficial Necrolytic Dermatitis (SND): The condition is caused by a liver disease. It is seen in older and smaller dogs. 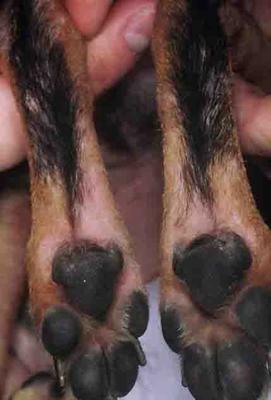 Symptoms are the accumulation of crust on paw pressure points. Gingival Enlargement: A non-cancerous growth that is triggered by periodontal disease. It can be removed by a veterinary dentist (top right above). Peripheral Odontogenic Fibroma: a type of tumor that is a benign (not cancerous) tumor (top left). Squamous Cell Carcinoma: A cancerous tumor that requires a biopsy to confirm the diagnosis (bottom right). Oral Malignant Melanoma (OMM): Forms in the soft tissues that line the tongue (bottom left). There are several natural remedies on the market such as the remedy Skin and Coat Tonic that can help to reduce the severity of symptoms and with long term use, contribute to a healthy skin and coat, including the healing of dog skin sores. These are not a cure, and are used along with specific treatment recommended by a veterinarian. they work by strengthening the body's natural ability to support healthy dog skin and hair. Understanding the causes and prevention of dog skin sores caused by parasites.